This puzzle has been up for a while so the answer key is now available at the bottom once you've given it a try yourself. So has anyone given it a shot yet? If you think you got it you can post your answers. Once I have a feeling everyone who wanted to has had a chance to complete the crossword, I'll post the answers. Also I'd appreciate some feedback if it was too simple? Too difficult? It's very parrot specific so probably not suitable for non-parrot people. However, anyone who has been participating in this forum should know any or all of the terms. I was just taking a look at it. 9. Psitticidae ? Sounds right but doesn't look quite right. 13. Feathers? I was thinking down feathers, I guess feathers would be the general word for it. It was fun. Some were really easy but others a bit harder. Like number 7, and I can't remember how to spell number 9.
sorry if this is old... is the kakapo really larger than a mealy amazon? 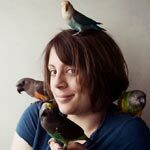 i alawys heard that the mealies were the largest true parrots aside from macaws? MY GOSH THAT IS A BIG BIRDIE! 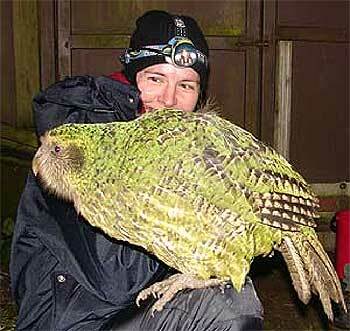 I kept hearing/reading of the kakapoo but never thought of looking up a picture..